I have always poured over statistics, in fact understanding numbers is vital to any Campaign Manager / Agent role, just as knowing where your party's strengths and weaknesses are is important for future strategy and success. At every count I push our Counting Agents to conduct accurate ballot box sampling, with varying degrees of success. This year, to improve understanding of the process and to demonstrate the correct way to sample, I am organising a fake "count" with a real ballot box, replica ballot papers, count staff and all the paraphernalia of the big night. 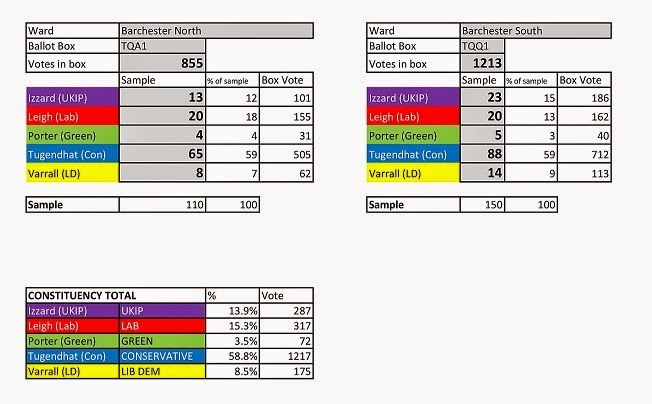 I have also developed (with my friend and statistician, Dr John Hayward) a user-friendly spreadsheet which will allow 50 samples and will calculate both ward by ward and constituency-wide results (see below). As always, happy to share my work with Conservative colleagues elsewhere - if you'd like to see/use the spreadsheet locally simply get in touch using the contact me option to the right of this blog. If we don't know each other personally please confirm where you are based and provide an official party / Association email address. 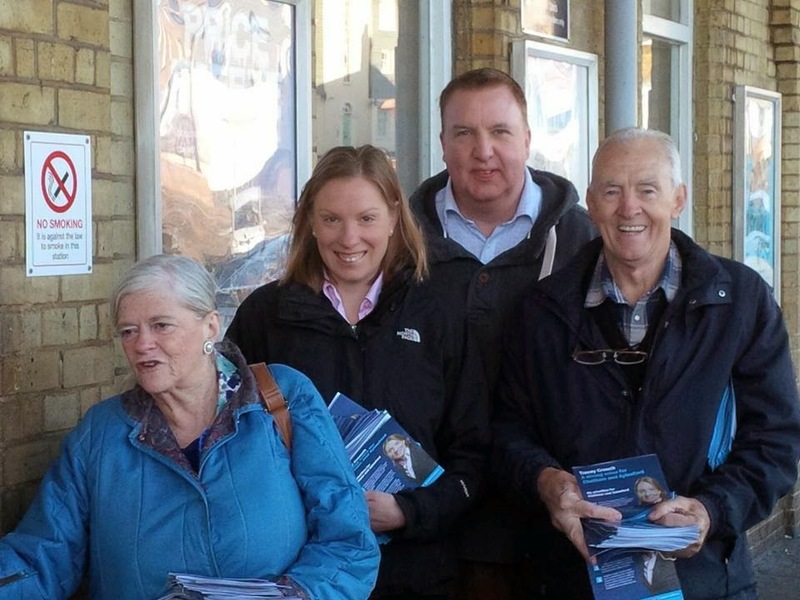 Team Crouch, with added Widdecombe, was out at Chatham Railway Station this morning, assaulting the eardrums of sleepy commuters. The Great Lady, never a shrinking violet, positioned herself directly in front of the ticket machines daring anyone not to acknowledge her. 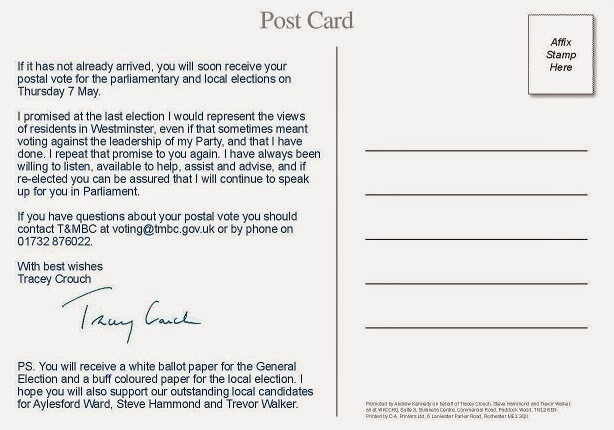 TRACEY CROUCH - HERE YOU ARE - HAVE A LEAFLET. Cars hooted, schoolgirls (and boys) asked for "selfies", autographs were sought and given and no-one who came within 20 yards could be in any doubt what they were required to do a week on Thursday. 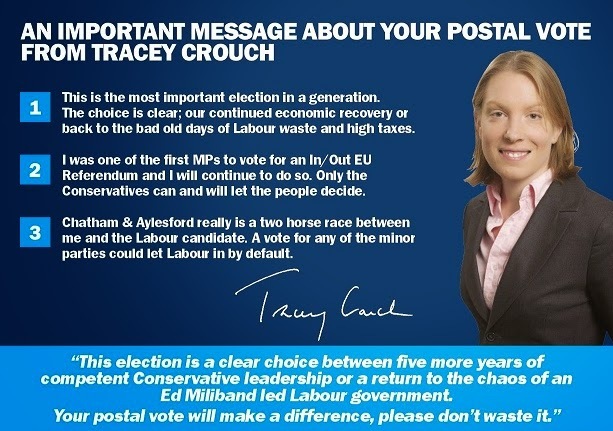 VOTE FOR TRACEY CROUCH. The highlight of the morning was a rough diamond builder who said to his mate, "Oh look, it's that bird from the dancing show." "Listen here young man, I do not have feathers and I cannot fly. I am therefore not a bird - And whilst I am at it - VOTE FOR TRACEY CROUCH a week on Thursday." "Did you see that Ann Widdecombe outside...?" "No, but I could hear her...they don't make them like than any more." And no-one could possibly argue with that! What a wonderful, considerate and delightful email to receive on a wet and windy Sunday morning! Edna Welthorpe (Mrs) would be proud. One of our younger (and fitter) candidates Daniel Markham in East Malling always sends me and the Association Chairman a digital print of his daily "run" when he also delivers his latest leaflet. It shows the route, time taken and average speed. Is the show over for Labour in Chatham & Aylesford? 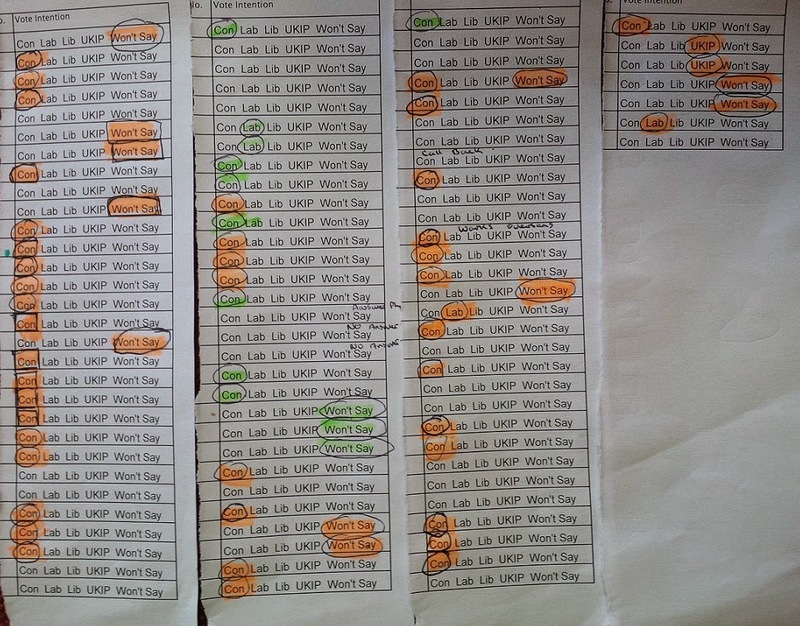 These are the results of our phone canvass of postal voters in one of Labour's better polling stations in Chatham and Aylesford. 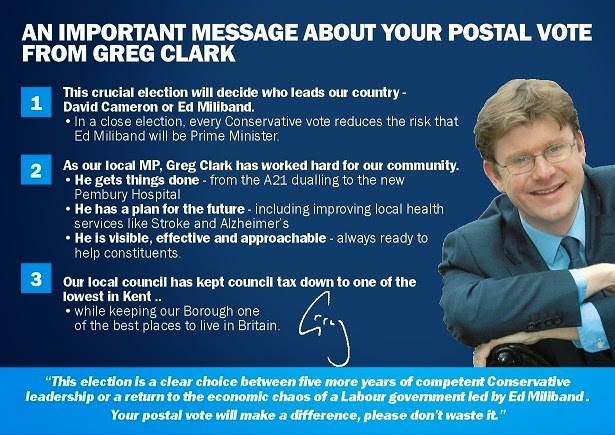 To be clear, we are calling all postal voters, not just pledged Conservatives. The Ground War in West Kent! 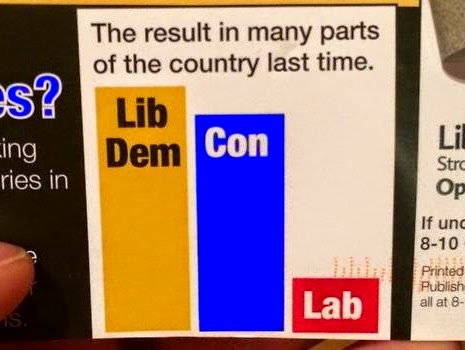 And in the constituencies, our volunteers have delivered 50,000 postcards to postal voters. In addition to the above T&M and TW have provided 120 hours of Campaign Support to target seats nearby. 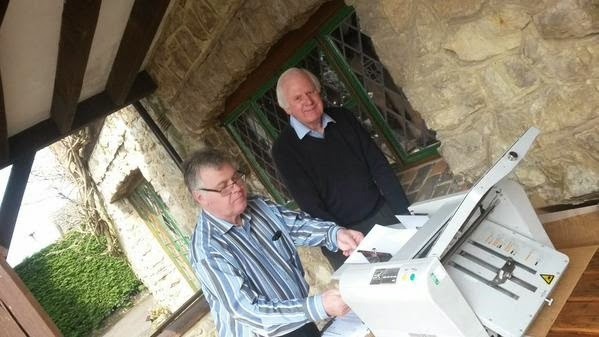 In fact, things are so frantic we have had to install a back-up folding machine in the garden of Chatham & Aylesford President, Joyce Gadd. Someone was concerned about what her "well heeled" neighbours would say about the "clack clack clack" noise, until Joyce pointed out that her neighbours were all inside the house packing envelopes! 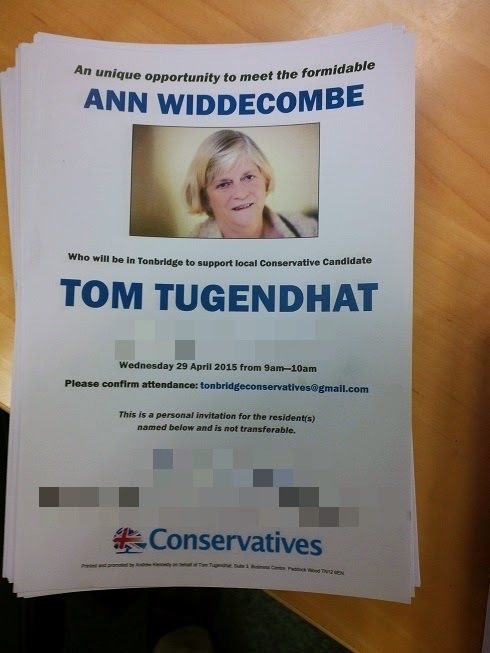 We are looking forward to welcoming Ann Widdecombe back to West Kent next week as part of her nationwide campaign tour. We are organising a series of events around the constituencies where she will be meeting community leaders and swing voters. At the start of the campaign I calculated that by the time the postal ballots landed on the doormats, the average voter would have received around 15 pieces of election literature and a degree of fatigue if not complete lassitude would have taken hold. Working with our parliamentary candidates I developed something new. 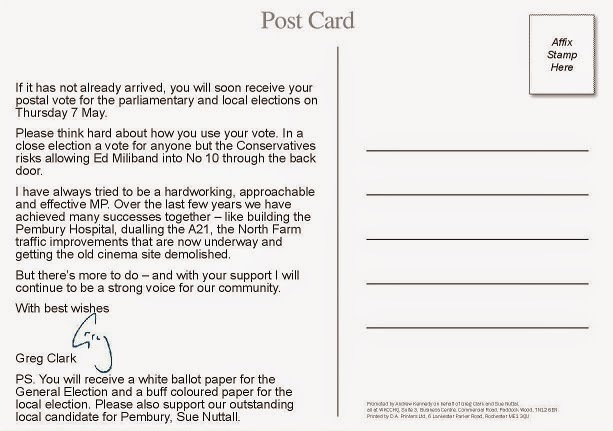 for postal voters, a smart A5 postcard with three core messages on the front and a brief GOTPV message on the reverse. Each postcard was personally "topped and tailed" and the recipients name and address hand written on the back. Our volunteers wrote n staggering 54,000 postcards in three days. These are now being delivered "knock and drop" across five parliamentary constituencies. An amazing feat of organisation only made possible by an outstanding team - thank you all! Today, our Phone Bank was up and running at full speed with a total of 48 volunteers each working a two hour shift. 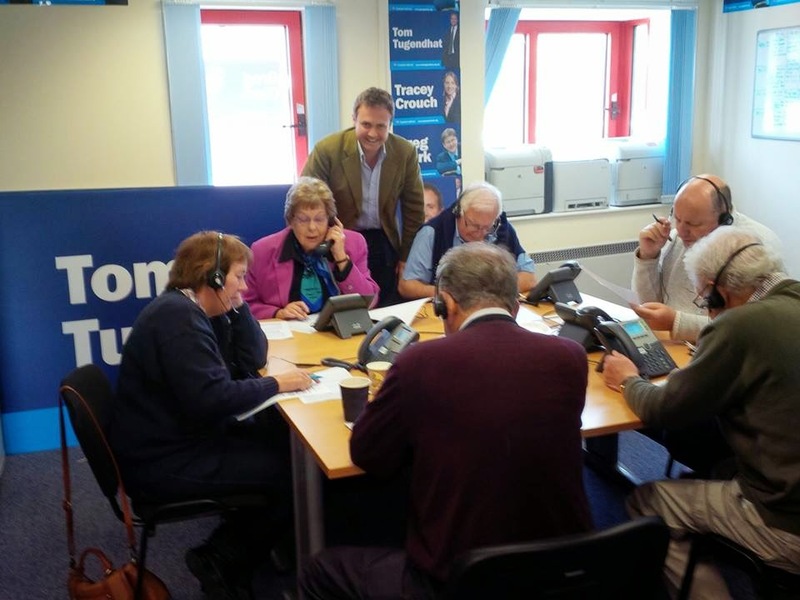 Between them they made over 4,200 calls to postal voters. My thanks to Tonbridge & Malling candidate Tom Tugendhat and the team who came in today. 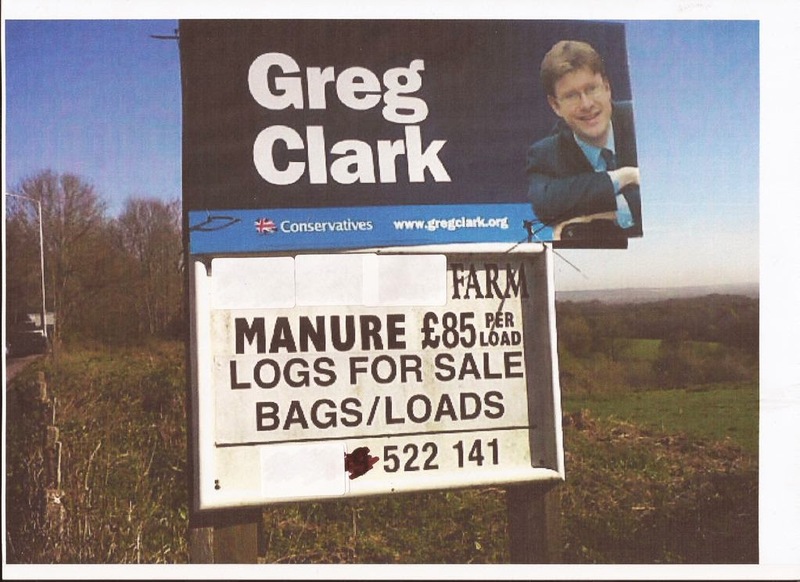 Tomorrow we welcome Tracey Crouch followed by Greg Clark on Friday. "The last thing we need is too many people voting UKIP and allowing Ed Miliband to creep in through back passage." At 3.30pm today I had five drivers on stand-by to take the last of the postal vote applications to the five councils in the West Kent Campaign HQ area. Here is a tale of two councils. Council One: when our driver entered, there was someone from Electoral Services in reception dealing with election enquiries and collecting in the last-minute postal vote applications (for those who don;t know the deadline was 5pm tonight). He was warmly greeted, thanked for dropping them off, and was on his way out of the building within a minute of arrival. Council Two: our driver entered, waited in a line at reception whilst the 7 people ahead of him in the queue where slowly dealt with by one stressed receptionist. When he reached the front, he was told to take a seat and "someone would be down soon". Fifteen minutes later (almost 40 minutes after he arrived) someone from Electoral Services appeared. Rather than apologising for keeping him waiting, he was greeted with "just as well you weren't three minutes later or you would have been too late." I won't name and shame Council B, but I will gladly give credit to Council A. Round of applause for Tonbridge & Malling, who, for 12 years, have never fail to exceed my expectations every time I deal with them. 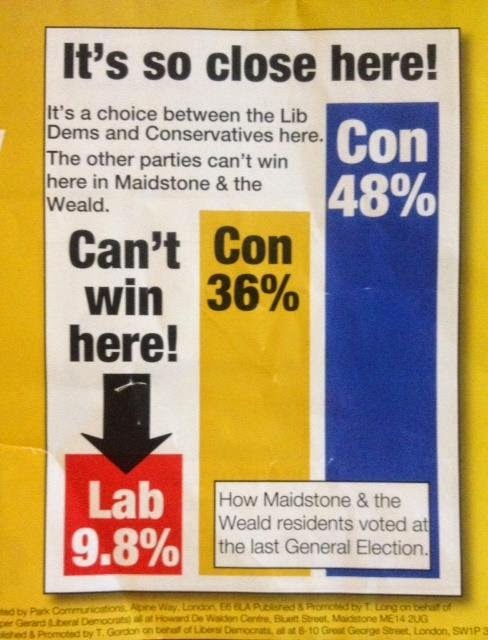 Here's a salutary lesson for anyone erecting election posters. When you find two perfectly placed poles in a friendly farmer's field, just the right size for attaching a correx board, always read what's on the sign beneath before attaching your candidate's poster above. Hat tip to @RealMBurgess for spotting our schoolboy error - red faces all round, but it gave us a laugh! very much aware of the Liberal Democrat woman’s flailing legs." The Poster Boys pulled-up outside a very grand house in one of our wealthier villages - a substantial portico with sandstone steps leading to imposing double doors. I rang the doorbell and heard a distant clang. No reply apart from a melancholy Irish Wolfhound who peered out from within. Most of these grand houses don't use their front doors so I trudged around the gravel to the side of the property where I found a well used kitchen doorway piled-high with Babour jackets and green Hunter wellies and rang another bell, this time answered. "You're not that mad axe murderer are you?" - which I though an odd greeting. "No, no - not at all..."
"Are you sure you're not a axe murderer?" "No, please trust me, I'm Andrew Kennedy (rummaging in my wallet for my business card). "Well, we saw you pull up in a van." "Why would you think an axe murderer would drive a van?" "Well, they might do, they have to drive something." "No, don't worry - I am the Conservative Party Agent, I've come to put up your garden poster." The lady looked someone relieved and shouted over her shoulder, "Don't worry Jean, he's not the axe murderer he's from the Conservative Party." After a long pause a mystery voice replied, "Well, in that case you'd better let him in." There's a wonderful Facebook page called "Overheard in Waitrose" where shoppers post surreal snippets of conversations such as, "Tobias would you fetch mummy a packet of Waitrose Essentials Macadamia Nuts." I am thinking of setting up a rival page; "Overheard at the Phone Bank". "Oh, you'll be in Phuket on 7 May. Do you have a postal vote. Oh, OK. You travel to Phuket six times a year? Really... that's a lot. What takes you out to Thailand so often? Oh my goodness. No No No - I don't really want to know any more." I am pleased to report the respondent was not a Conservative pledge. Lord Howard welcomes another defector and leads the biggest campaign team yet! 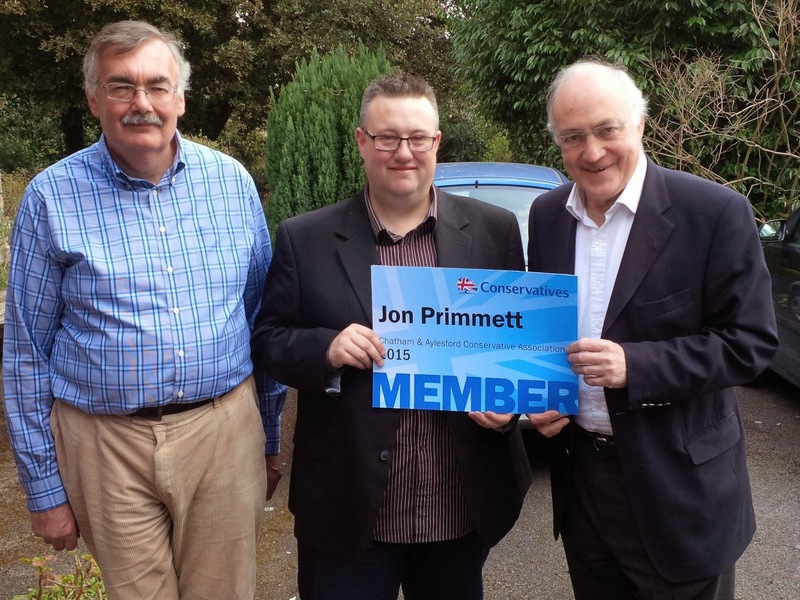 It was an honour to welcome former Party Leader Lord Howard of Lympne to Chatham and Aylesford today, who in turn welcomed into the Conservative family a former Labour activist and council candidate Jon Primmett, with the presentation of a giant membership card. After a quick cup of tea, Lord Howard led Tracey's biggest campaign team yet - nearly 40 activists - onto the streets of Princes Park and Snodland - every single activist was "internal" (from within C&A's own boundaries) once again demonstrating the commitment and dedication of our membership when it comes to campaigning. Running West Kent Towers is somewhat akin to running a family of demanding children. "Can I have..... I want..... Can you just..... I need..... Have you got..... Please may I have......." And the worst culprit is Matt Boughton. Ever since I put him in charge of the team erecting correx boards I have had daily demands of what he needs and constant reminders that I have not yet procured anything on his list. Apparently "all I needed to do" was pop into Wicks. The truth be known, until today, I had no idea what "Wicks" was (I thought something to do with a candle) and half of the things on Matt's list were foreign words. Wicks, apparently, is that large shed of a building opposite Chatham Railway Station where I once received a parking fine for leaving my car whilst attending Craig Mackinlay's barbecue. It's like Homebase for butch men, most of whom were wearing tight jeans and lumberjack shirts. A bit like the Kings Arms in Poland Street without the Kylie. Matt was like a little boy in a sweet shop, "can I have four of those and two of those and...." whilst I traipsed around behind with my debit card and a look of bewilderment. 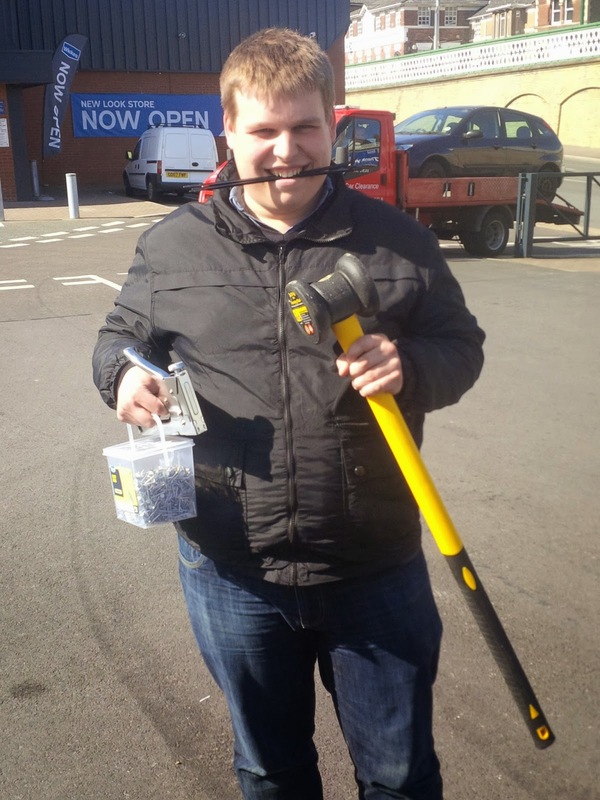 My only active participation was when he came to buy a mallet. Having used a mallet for many years to bang in mooring pins, I knew the one he was looking at to be wholly unfit for purpose. "Wouldn't you like one of those big ones?" I asked - pointing out a bright yellow thing with a 4.5kg head. His eyes widened like Augustus Gloop spotting a giant gobstopper. 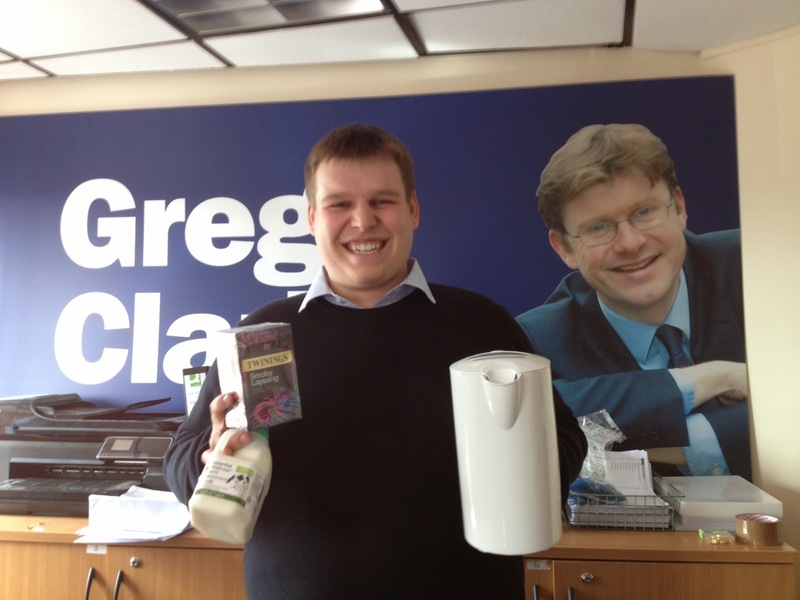 So watch out West Kent - the best equipped Tory Poster Boy is coming to a field, tree or garden near you! An interesting Tweet from Medway Labour today. "Medway is a two horse race between Labour and the Conservatives as only the two main parties are contesting all council seats." Labour clearly believes that failing to contest every seat means you are not in serious contention to win. I have therefore Tweeted Medway Labour to ask, if this is the case, have they given up on Chatham and Aylesford, as Labour have failed to field a full slate of candidates here? Given only the Conservatives are contesting all 30 council seats, is C&A a "one horse race"? I am awaiting their reply. A gaggle of Tonbridge & Malling's finest door knockers gathered in the shadow of Mickey's Diner, site of a hundred Tracey Crouch post canvassing lunches, at 9am today. This was the rendezvous for our latest Campaign Support Away Day to help friends and colleagues in target seats. 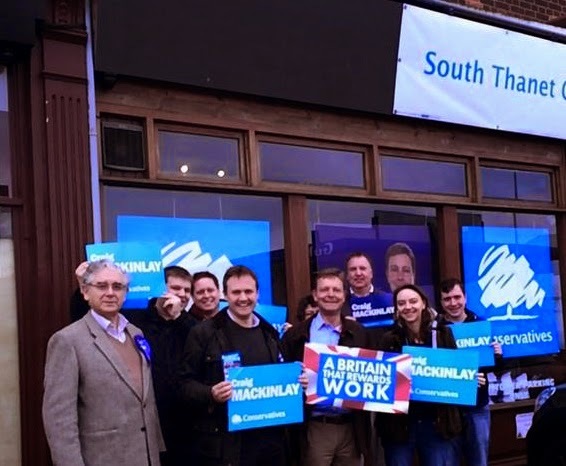 Today it was the turn of my old friend Craig Mackinlay who is fighting the good fight in South Thanet. The convoy was delayed as Lieutenant Colonel Tugendhat was lost. This provided an open goal for Major Richard Long who delighted in asking the crowd "what's the most terrifying thing in the British Army? An Officer with a map." The missing parliamentary candidate however was the least of our problems. "Where are we going?" said the former Member of Parliament for Gravesham? Matt the Intern said he had emailed the destination postcode yesterday but this caused a degree of consternation as his Sat Nav was manufactured before the technology recognised postcodes and only worked by street name. This brought a chill to my spine as I recalled a five hour car journey to Manchester for Party Conference in the back of the former MPs car with Allan Sullivan complaining about travel sickness in the front. Jacques was on an anecdotal loop with the same stories coming around every 47 miles. By the time we reached Hilton Park Services not only had the SatNav given-up the ghost but we had heard what Ted Heath said to Dame Elaine Kellett-Bowman during the Maastrict debate at least 5 times. Suddenly the car started veering across the M6 as Jacques jabbed furiously at the Sat Nav. "What the hell are you doing?" asked a green-at-the-gills Allan Sullivan. "I have to remind it where it is so it knows where it's going" came the reply. Despite these glitches we arrived in Broadstairs on time and we were greeted at Campaign HQ by Craig, his Campaign Manager Nathan Gray and the lovely Marion Little. Cue hackneyed photo of candidate surrounded by happy activists holding posters. We split into three groups and went off to different areas. I was canvassing with Matt Boughton and we were visiting a carefully selected target group of residents so it was difficult to gauge how we were doing overall. Obviously there was UKIP support, but for every UKIP voter we found I met two or three who thought it would be a disaster for Thanet and for the country if UKIP won. In all my time in active politics I have never met so many people who were so absolutely opposed to one particular candidate. 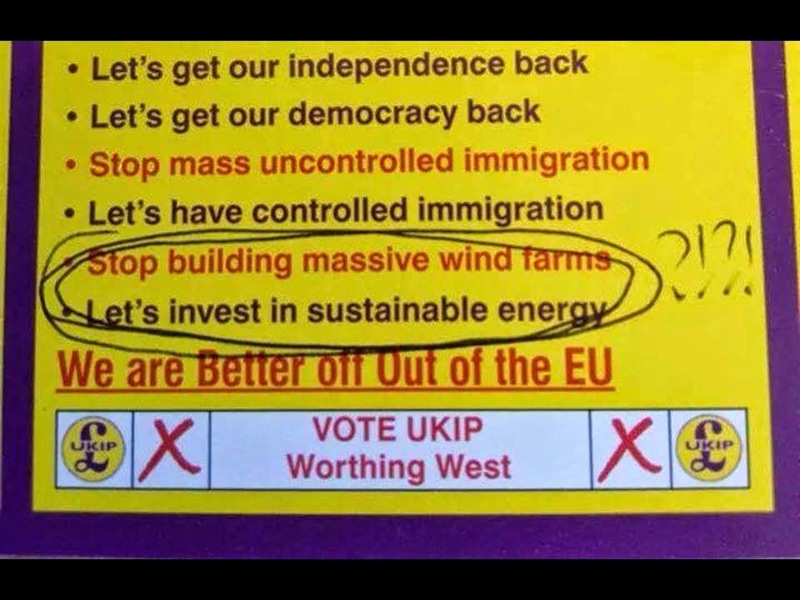 In fact, in one road by the seafront Matt and I counted eleven (out of twenty) houses with UKIP Not Welcome Here posters in their windows. 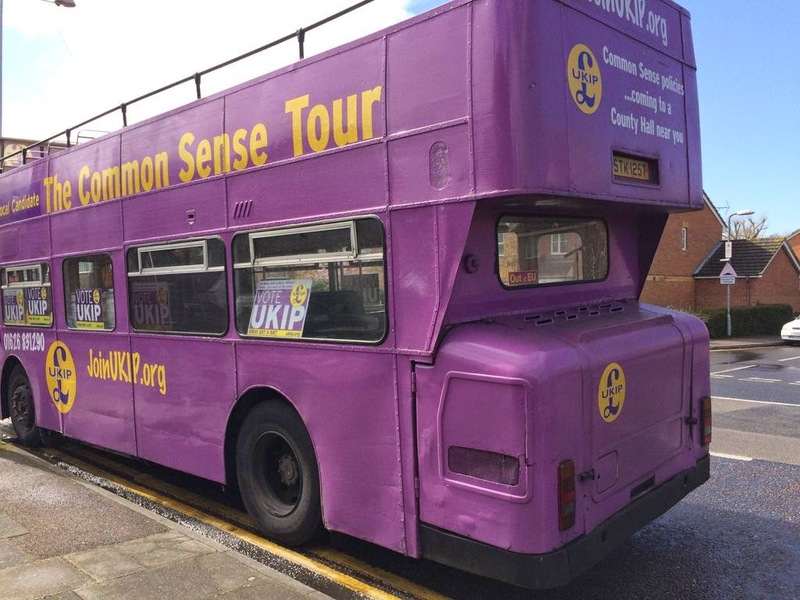 After canvassing we headed back to base, but en route came across the UKIP Battle Bus parked illegally on double yellow lines with the local activists inside the nearby pub drinking. What really annoyed me about this was two things. Firstly, the two roads either side of the pub were almost clear of any parking restrictions so the bus could (and should) have parked legally there, but chose not to do so. Secondly, imagine a group of UKIP activists walking down a road and coming across a car with Eastern European number plates parked illegally. There would be outrage and anger at "yet another example of these people disrespecting our laws and traditions and seeking to impose their values." But consistency has never been their defining character, has it? It appears their ineptitude is spreading, with this delight appearing today in Maidstone. Maybe the pressure is getting to them? West Kent Conservative Campaign Headquarters, how can I help...? Caller: "Now look here - this (name of candidate) did her mother design dresses for Harrods?" Me: "I don't know Sir, why do you ask?" "What do you mean "you don't know" you are her agent, aren't you?" "Yes, but I have never met her Mother nor enquired about her previous employment." "Well, I think she designed dresses for Harrods." "Would you like her email address so you can ask her?" "I'm 87 and deaf. And I've lost my spectacles"
"If it's important, I'll ask her for you and phone you back." "Would you? I'd really like to know. There's a donation to the Fighting Fund in it..."
"OK, leave it with me and I will endeavour to find out"
Hi (x), a gentleman has just called who would like to know if your Mother designed dresses for Harrods? He's going to send a donation to the Fighting Fund." "Oh! That wasn't my Mother but my husband had an Aunt who was a designer. It was probably her." "Hello again Sir, it's Andrew Kennedy from the Conservative Party." "Who? You will need to speak up. I'm 87 you know. And deaf." "You asked if (X's) mother designed dresses for Harrods." "Oh yes, and did she?" "No, it was her husband's aunt." "Oh dear, that's a shame." "May I enquire why you were interested...?" "Yes, I bought one for my fiance. It was delightful"
"Oh, and did she like it...?" "She was wearing it when she ran off with my tennis partner. I wish I'd never bought the bloody thing, it cost a small fortune." "So am I. I shall send you £25.00." Would Sir Winston have survived the tabloid mob? A few weeks ago we were honoured to welcome Sir Nicholas Soames MP to Tonbridge & Malling. During the course of his presentation he spoke of his grandfather, Sir Winston Churchill, and the events around his death. I was particularly moved when he recalled the words of his grandmother, Clementine, who said, "he belongs to the nation now." Today I found myself driving through Woodstock and made a small detour to St Martin's Church in Bladon, to visit Sir Winston's grave. It seemed the right thing to do, even though I have visited previously. On the grave visitors had left tributes and small bunches of flowers, but attached to one pot was a simple handwritten note commemorating Clementine Churchill's birthday; she was born on 1st April. The note was from "your grandchildren" and of course included Sir Nicholas. He may well "belong to the nation" but Sir Winston and Clementine Churchill were also parents and grandparents who made enormous sacrifices for public life and in service to their country. Nobody who has visited Sir Winston's grave in a simple churchyard of an unpretentious church in a typical English village could fail to be moved. Here is the final resting place of the greatest of men; his place in history so secure that he requires no great mausoleum to remind us of his work. Yet today, surrounded by hope in the form of spring flowers and Easter renewal, and reading a loving note from his grandchildren; I was unashamedly overcome by humility. This weekend, for reasons not of my choosing, I have spent too much time reading a certain tabloid newspaper, and in particular the nasty and spiteful comments of that newspaper's readers (or at least the section of them who comment online). The instant condemnations by people who have never met the targets of their anger, let alone sought to verify the truth of what is written, is sickening. What will the pig-faced, ranting mob do when they have razed politics to the ground only to find the scorched earth they leave behind is too sour to attract any new growth? Had Sir Winston been in politics today would the tabloid lynch-mob have finished him off post Gallipoli? If not, they would have done so after Norway - but his finest hour was still to come. And those who exploit free speech to attack and sneer and destroy from the safety of anonymous comments have perhaps more reasons than most to celebrate what he was subsequently allowed to achieve. My 2015 April Fool prank on Jon and Matt (delivered jointly with the help of one of our parliamentary candidates) along with Iain Dales recollection of his 2010 story about local Returning Officers going on strike in protest at having to count votes during the night time, resulted in me reminiscing (with a degree of guilt) about some of my earlier pranks - and a sudden desire to "fess up". 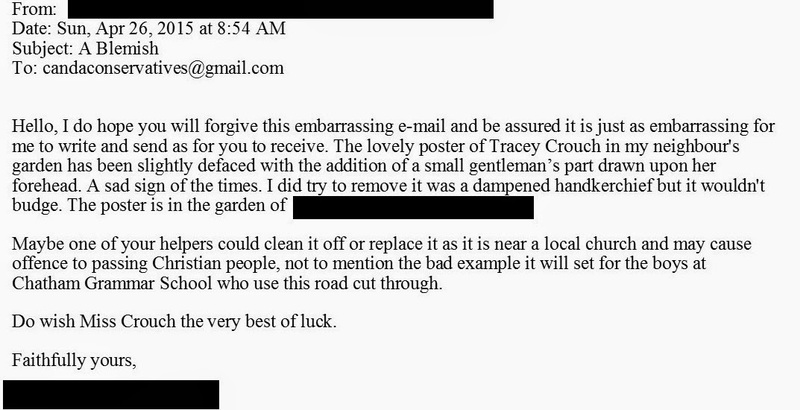 My first confession (and apology) is to friends in Southampton - even though my prank was deserved retribution. It was the mid 1990s and I had arranged a dinner date with someone I had been wooing for a long time. Not wanting my "friends" to gatecrash and ruin my chances, I had maintained absolute secrecy and even booked a restaurant many miles away in Winchester, where I wouldn't be "stumbled upon". Unbeknown to me, however, someone had heard me on the phone and let slip the venue. When we arrived at 8pm the restaurant was almost empty, even though it was a Saturday night. Then, to my horror, over the next 30 minutes almost every table around me was taken by groups of two and four, until I was completely surrounded by 'friends' from home - who spent the evening reminding me loudly of previous indiscretions and recounting embarrassing drunken tales. I waited 8 months for my revenge, but it came in the form of over 30 early morning phone calls to my friends house, all of which had been in response to posters on lampposts and shop windows advertising a "house clearance sale" along with instructions to "phone early for an appointment to view what's on offer". Apparently the householders were "emigrating imminently to New Zealand" and selling off the entire contents of their home. No offer refused, though the buyer must collect. Bargain hunters should "phone from 6am on Sunday for an appointment to view later that day". My second confession is to the wonderful ladies who ran the Conservative Ladies' Committee in Wallasey. The mid 1980s were a gentler and less suspicious age - and before the advent of desk top publishing printed matter was taken at face value. A letter therefore on what looked like 10 Downing Street notepaper, complete with a Westminster postmark, would almost certainly be believed, which probably (and thankfully) wouldn't be the case now. The letter in question was from the "Senior Correspondence Clerk" and was to inform the Ladies' Committee that the Prime Minister had personally asked the Party Chairman, John Gummer MP, to visit their weekly coffee morning to thank them for their recent efforts on behalf of the Party. As the weeks passed there was no mention of the letter or any VIP visit and I assumed that the 1 April date on the letter had been spotted and the matter consigned to the dustbin. That was until the day concerned. My Mother, who was a regular attender at these events, told me later that day that when she arrived all the Ladies were wearing their best dresses and all had had their hair done specially. The table (upon which was normally placed a plate of slightly stale biscuits) was groaning with freshly made cream scones and home-made cakes. The old green crockery had been replaced with fine bone china cups and saucers, lent by various members and supporters. As the minutes ticked by every sound of a car door slamming was greeted by the Officers jumping to attention and waiting by the door in a receiving line, only to look crestfallen when another regular member walked-in. Finally, at midday the Chairman announced, "Ladies, I am sorry - we were expecting a special guest but it appears he has not been able to come. Please start on the food." At this point a dog-eared letter was produced and passed-around for all to see. The date the letter was written and soon spotted and announced, much to the merriment of many (who were not all fans of the somewhat aloof and grandiose Chairman). I've just been sent an email by Labour asking me to pick three (from 20) reasons I would like to see a Labour government. This will generate a nice little graphic for me to share on social media. Of those twenty stated reasons, 15 of them would result in significantly increased government spending. The other 5 were so woolly as to be fatuous, ie "because I believe in fairness". Not one of the twenty reasons to vote Labour dealt with the debt or deficit or how Labour would balance the books. Obviously I am not going to vote Labour, but surely every fair minded swing-voter must look at this list, and note omission of financial responsibility, and judge Labour wanting and unready for the responsibilities of office? As Mrs Thatcher once famously said, "The trouble with Socialism, it always runs out of other people's money to spend." 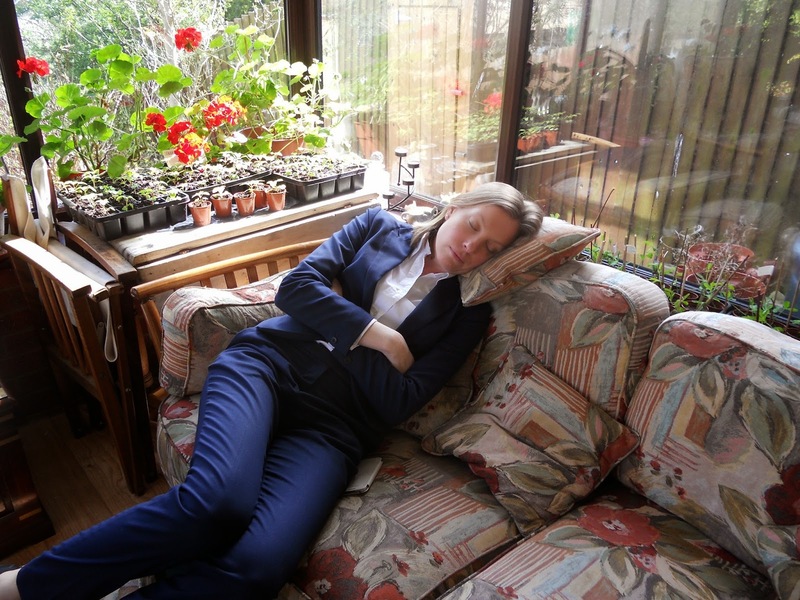 Too many 15 hour days on the campaign trail are clearly taking their toll on poor Tracey Crouch. She'll probably kill me for publishing this - though most of us were grateful for 20 minutes peace. Quick! Buy a new kettle and a lemon without pips! 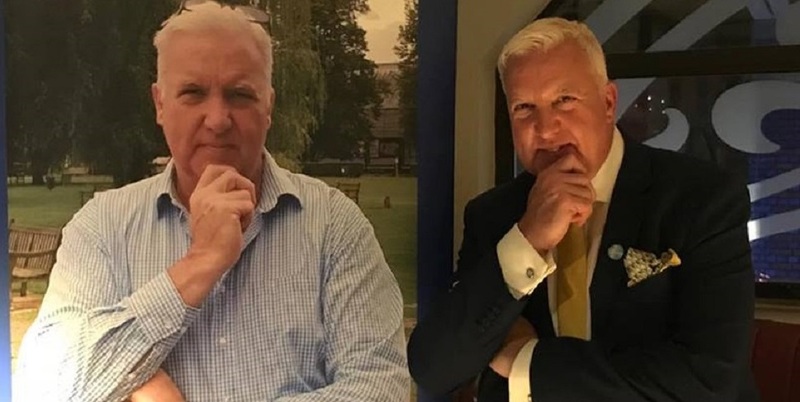 If you are the Office Manager or the Intern at West Kent Towers and a mischievous parliamentary candidate phones at 11.30am to tell you a "very very significant" VIP will be arriving, en route to a press conference in Medway, and he will need to use a desk for 30 minutes - be very suspicious. At 11.30am today this is just what happened. "Matt... run over the Waitrose and buy a box of Lapsang Souchong and a pip-less-lemon. Jon - quickly, clean the lavatory and Hoover the floor." Matt, thoughtfully remembered that our kettle was broken - so he bought a new one of those, too. Moral of story - when someone calls and tells you to go to Waitrose in search of Lapsang Souchong and a pip-less lemon, make sure it isn't the Wednesday 1st April.